Steam cleaning or hot water extraction is the leading method in carpet cleaning. Las Vegas Carpet Cleaning truck mounted machines are the latest in technology and in water savings while providing the steam power for a full clean. The truck mount is a special vehicle that has been adjusted to carry and operate the steam cleaning machines. Out of the truck hoses are pulled into your home, or business and they are capable of reaching any place easily. This method includes the shampooing and the extraction at the same time, saving time, water and cleansing for best results. This method is safe for most carpets. Las Vegas Steam Cleaning service starts with pre-treatment , stains inspection, and pre vacuuming. Our technicians are so experienced in finding the spots, and Applying the right pre-conditioner to your carpets, that you might not even notice this process. The powerful truck mounted carpet cleaning or hot water extraction process uses fresh water heated into steam, which applies high pressure that brakes up all the spots, debris, and dirt from the carpets, which are immediately sucked up into the unit. The extraction is so powerful that even though we used water in the process, the carpet is only a little damp after the steam carpet cleaning. Usually the steam cleaning can take care of most of the stains, but Las Vegas Carpet Cleaning will make sure that all the spots, stains, spills, and discoloration is treated to make sure the carpet is treated and gets its original look, as if nothing has happened to it. With our method of steam carpet cleaning your carpets will be dry in a few hours. We make it our point to get your life back to usual as soon as possible. We understand that you would like to get back to normal, but this small waiting period is necessary to make sure your carpets stay as clean as possible. 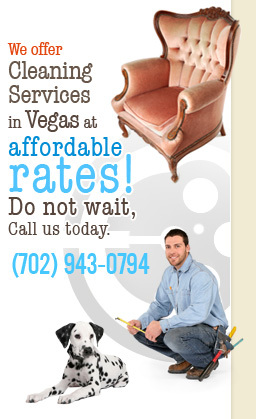 Carpet Cleaning Las Vegas has serviced many many customers in Clark County, NV to full satisfaction. Our goal is to exceed your expectations and provide efficient good job. Whether you are moving in, buying a home, or doing a routine clean in your home, office, or commercial venue.